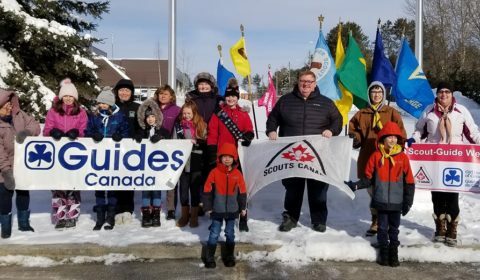 BRACEBRIDGE — Scouters, Guiders, and youth from Bracebridge Scouting and Guiding, joined Bracebridge Mayor Graydon Smith in raising the Scouts Canada Flag at the Bracebridge town hall. February is a special month for Scouts and Girl Guides worldwide. This is a time of celebration for Scouts Canada and Girl Guides of Canada – a time when two world‐wide youth movements honour their heritage and a time to recognize the good work both Movements do for the community. Each year, both movements celebrate Feb. 22, the birthday of Scouts founder, Lord Robert Baden-Powell and his wife, the World Chief Guide, Lady Olave Baden-Powell. For the past four decades in Canada Scout-Guide Week has been recognized. This year Scout-Guide Week is February 17 – 24. Across Canada celebrations include camps, expeditions and mall displays, special banquets and parades. To register your child in cuiding, contact Audrey Forth at 705-645-8331. You can also surf over to www.scouts.ca or www.girlguides.ca to find a group near to you. Bracebridge Mayor Graydon Smith, centre, welcomed some Guides and Scouts and their volunteer leaders to the town hall to hoist their flag for their special week. well-rounded individuals, better prepared for success in the world. For tens of thousands of children and youth across Canada, Scouts is the start of something great. ScoutsCanada is the country’s leading co-ed youth organization, offering programs for children and youth aged 5-26 in multiple languages, reflecting Canada’s multicultural landscape and communities. For healthy, active living, leadership skills, and caring for the environment: it starts with Scouts. For more information, visit Scouts.ca. with the United Church as the sponsor. persuaded May McCracken to start the Guide Company. The First Scout‐Guide Week happened in 1926 and it continued up until the 1940s. For more than four decades, Scouts and Guides have celebrated Scout‐Guide Week nationwide. This year it is Feb. 17-24.
between national public relations personnel of both organizations. his wife and World Chief Guide, Lady Olave Baden‐Powell. title interchangeable (i.e. “Guide‐Scout” or “Scout‐Guide” Week).